Happy ye olde New Years' Eve!!! 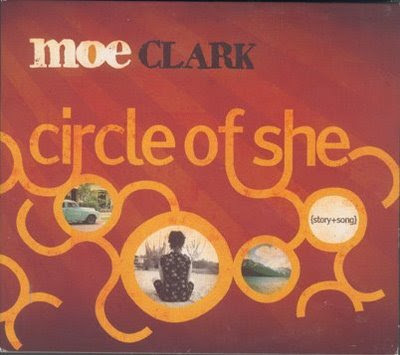 Tonight's Ashes, Paper & Beans, started with a mini profile of three spoken word tracks off Calgarian Moe Clark's debut CD Circle of She: "Expose It", "Time", & "Party of Saints". Next was veteran Calgarian Sheri-D Wilson (w/ Russell Broom) and "Big Sky Alberta". 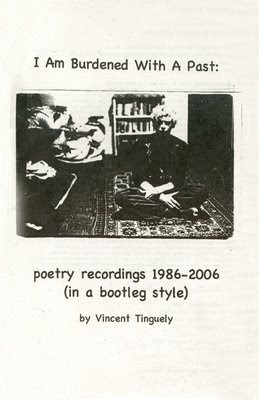 Feature was eight tracks by Vince Tinguely from his chapbook and CD I Am Burdened With A Past: "Do You Have Something A Little Less Totalitarian? ", "Scarlett", "Collateral Damage", "Escape Velocity", "TV Poem 2", "I Have No Idea What I Want", "Reminder (The Shock and Awe Mix)", & "Oilers". Lastly, off the SLAM soundtrack, was Lauren with "Run Free". 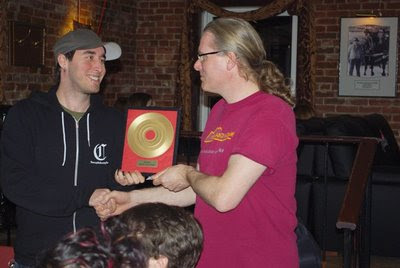 Last night, at Wilser's Room, I was presented with my fifth Barry Award for, or because of, Ashes, Paper & Beans: Fredericton’s Writing & Arts Show at CHSR 97.9 FM. This time I was co-winner of the Favourite Spoken Word program award. Very nice. I'd like to thank everyone who has made the program possible by being on it or by contributing their recordings. I'd also like to thank everyone, staff and volunteer members, who have worked to keep CHSR running as a long-time community radio station in Fredericton. Our 50th anniversary of broadcasting is coming up in January 2011.
freedom, or . . . ?
. . . back in the radio station . . .
Tonight's Ashes, Paper & Beans show featured my recording of the 9th International Multicultural-Multilingual Poetry Reading that happened on Saturday, 21 mars 2009 at the Charlotte Street Arts Centre. Emcee was Jo-Anne Elder of revue ellipse mag & Vice-President of Literary Translators’ Association of Canada / Association des traducteurs et traductrices littéraires du Canada (LTAC/ATTLC). Poets who read their poems included Carlos Morales, Ken Corbett, Joe Blades, and Nela Rio. Other poem readers included Tim McLauchlin, Johanna Blum, Sophie Lavoie, M. Travis Lane, Melanie Bell, Elizabeth Coburn, and Scott Bell. Nela Rio and the Nuestro Espacio display @ the reading. Found about 11:30 AM, Thursday, 12 March 2009, half-in the ice beside the recycling station bin on the FREX Grounds, Smythe Street, Fredericton, NB. 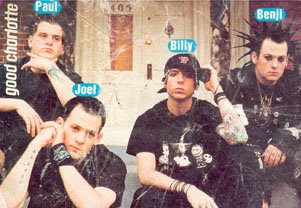 Photo of the boys of Good Charlotte cut from a magazine. In conjunction with The United Nation’s Dialogue Among Civilizations Through Poetry, World Poetry Day (21 March), Mother Language Day (21 February), and World Water Day (22 March). Organized to foster tolerance, respect and cooperation among peoples. Organized by Nela Rio, Founder of the International Multicultural-Multilingual Poetry Reading, with the support of Gallery ConneXion, revue ellipse mag, Broken Jaw Press, Latin American Cultural Centre, Literary Translators’ Association of Canada / Association des traducteurs et traductrices littéraires du Canada, Registro de Autores Creativos de la Asociación Canadiense de Hispanistas, Latino Association of New Brunswick, and Grupo Fredericton de la Academia Iberoamericana de Poesía. We invite you to join us in the 9th celebration! 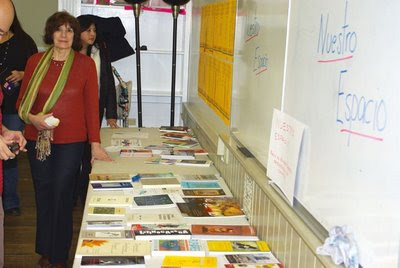 Previous celebrations, since 2000, have featured poets and members of the community reading in many languages: English, French, Spanish, Portuguese, Cantonese, Chinese, Japanese, Dutch, Danish, Urdu, Turkish, Amharic, among others. This event is open to the general public and admission is free. Please include your name, postal address, email address, the text of the poem (use Times New Roman, 12 point). The poem should have 30-lines maximum including stanza breaks (this is for the purpose of printing it on a poster for exhibition at the event). Send this information to nelario@rogers.com BEFORE MARCH 15, 2009. Note: this community event will not be paying artists or performance fee. (Read a poem by your favorite poet at this event). Please include your name, postal address, email address, the name and country of the author poet, the text of the poem (use Times New Roman, 12 point). The poem should have 30-lines maximum including stanza breaks (this is for the purpose of printing it on a poster for exhibition at the event). Send this to nelario@rogers.com BEFORE MARCH 15, 2009. Tree Reading Series—Time and Location: Please join us! Tree Readings happen year-round on the second and fourth Tuesday of each month. Doors open at 7:30pm, with a brief 'open-mic' set at 8:00pm. Our featured reader for the night follows the open-mic set. We're located at the Ottawa Arts Court in the Library room. For more information about the series, contact Rod Pederson by email at treereadingseries@live.ca or call (613) 292-1886. The Ottawa Arts Court is located at 2 Daly Avenue, Ottawa, phone (613) 564-7240. The Arts Court is located at the corner of Daly Avenue and Nicholas Street, just across from the Rideau Centre, where there is abundant parking available.